The KUC Prayer Shawl Ministry group shared a beautiful lunch at “The Shores” on December 12th. The hostess was Muriel Cluett our most prolific shawl knitter and our inspiring role model. Muriel shared her family’s plans for celebrating her 100th birthday in July 2018. 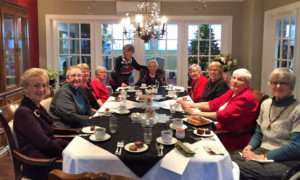 The group of friends caught each other up with news of their families and shared their plans for Christmas. What a lovely afternoon of food and fellowship. Doreen, Leslie, Muriel, and Corinne sorting through the donated yarns. Lois wearing several of Irene Covington’s pins!